The information and design are owned by SpoonFeeder ("SpoonFeeder"). Except for a single temporary copy in a single computer's memory and a single permanent copy to be used by user, the information and software contained herein may not otherwise be used (not copied, performed, distributed, rented, sub licensed, altered, stored for subsequent use, etc., in whole or in part, in any manner) without SpoonFeeder's express prior written consent. Each authorized copy shall include the above copyright notice and this permission notice. All other rights reserved. All information and software contained herein is obtained by SpoonFeeder from sources believed by SpoonFeeder to be accurate and reliable. Because of the possibility of human and mechanical error as well as other factors, SpoonFeeder is not responsible for any errors or omissions in the information and software. 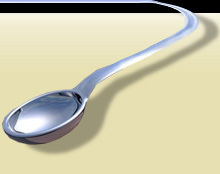 SpoonFeeder makes no representations about the suitability of this information and software for any purpose. Information and software may be changed at any time without notice of any kind. The information and software is provided "as is" without expressed or implied warranty of any kind. SpoonFeeder disclaims all warranties with regard to the information and software, including all implied warranties of merchantability and fitness for a particular purpose. In no event shall SpoonFeeder be liable for any special, incidental, indirect or consequential damages or any other damages whatsoever, including without limitation, any loss of use, lost data or lost profits or opportunity, or punitive damages, whether in an action of contract, negligence or other tort action, arising out of or in connection with the accuracy, use or performance of this information and software. Some U.S. states and foreign countries provide rights in addition to those above, or do not allow excluding or limiting implied warranties, or liability for incidental or consequential damages. Therefore, the above limitations may not apply to you or there may be state provisions which supersede the above. Any clause declared invalid shall be deemed severable and not affect the validity or enforceability of the remainder. These terms may only be amended in writing, signed by SpoonFeeder and are governed by the laws of the State of Michigan. The links in this area will allow you to leave SpoonFeeder's site. The linked sites are not under the control of SpoonFeeder and SpoonFeeder is not responsible for the contents of any linked site or any link contained in a linked site. SpoonFeeder is providing these links to you only as a convenience. The inclusion of any link does not imply endorsement of the site by SpoonFeeder.